Today we met a master and I was so excited, but allow me to start from the beginning. In the past few days, we finished visiting all the temples in the area of Kochi City, and it was time for us to check out of our hotel and to start heading south. We did not start early in the morning. The Nikko hotel has a fabulous breakfast, and we knew that it would be the last time for quite a while, for us to get such a great variety of gourmet healthy choices. So we lingered over breakfast, and then packed and left. From temple 35, we picked up the pilgrimage route where we had left off, and walked on quiet rural streets. It was a pleasant walk and soon we left Tosa City, and the road meandered in a narrow valley, wedged between tall mountains on both sides. We were heading towards the Southern coast. We walked though a long tunnel which I have begun to enjoy, because the tunnels are shaded and breezy and it feels almost like there is air conditioning, if you can ignore the smell of diesel from the cars and trucks. By the end of the tunnel, we could see the coast. A few shops selling fishing supplies lined the Main Street. A man in a shiny black sedan stopped his car and came over to me. He asked me if we were pilgrims. The reason that he asked if we were pilgrims, was because we were not wearing our white pilgrim’s jackets. We had no time to do laundry the day before, so we just packed them away in our backpacks, intending to do a large load of laundry as soon as we reached our accommodation tonight. I said that indeed we are pilgrims. He gave me a gift of two care packages filled with crackers and snacks, along with two ziplock bags filled with ice and some straws, to drink the water after the ice had melted. I put the ice on my heart and it cooled me down. 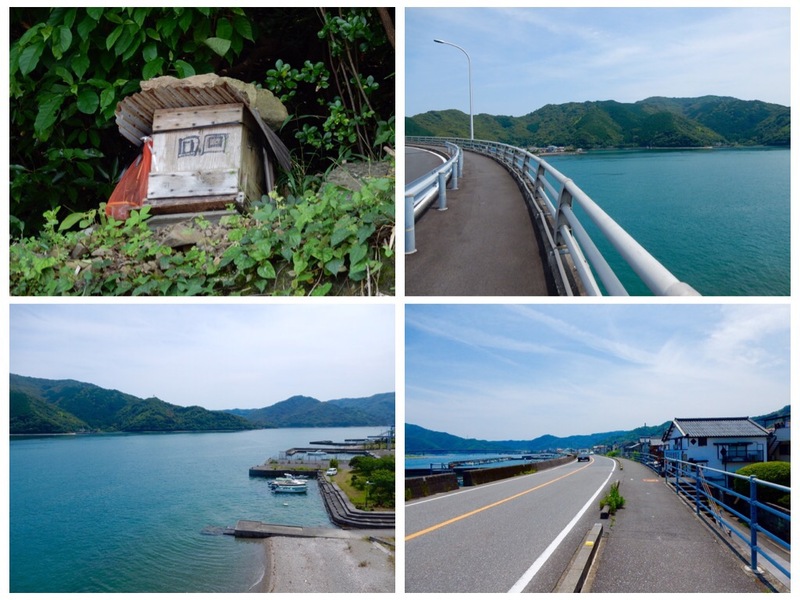 I also put it on the back of my neck and enjoyed the cooling effect as we crossed a very sunny bridge which connected two islands. I was so touched by his kindness. Jules and I were in awe of how he happened to have in his car two plastic bags filled with ice to offer us….. There were hardly any other walking pilgrims along the way. Today we saw only one young Japanese man who told us that like us, he plans to do all of the 88 temples in one go. He said that he walks about 30 kilometers a day and that he thinks that he could do the whole pilgrimage in six weeks. That is way faster than we intend to go. He told us that he lives in Osaka, that he camps outdoors when it does not rain, and that he stays in guesthouses when it is very rainy. He said that in two weeks the rainy season will start. He also said that his feet were doing well but that his leg muscles cramp occasionally. The coastline appeared to be subtropical, with large palm trees. We saw a few fishermen sitting on the pier with umbrellas to shade them, and a few kids with fishing poles and nets rode their bicycles around the ponds, hoping to spot and catch catfish. Shōryūji, Temple 36, is known as the Temple of the Green Dragon. Kōbō Daishi built this temple in memory of his Chinese master Keika (Ch. Hui-kuo). Kobo Daishi went to China at the request of the Japanese emperor in order to expand his knowledge of Buddhism, and to share what he learned with the elite of Japan. Before leaving China to return home, Kōbō Daishi threw a pointed Vajra (Tokko) in the direction of Japan, and temple legends say that it landed in the branches of a pine tree, right at the rear of the present temple. This story is very similar to a story that we heard in Bhutan, in which Padmasambava shot his arrow all the way from Tibet and it landed in Bhutan, where he eventually found it and built a temple in that location. While we were resting, a man came over to me and gave us some gifts. The first Osettai was a set of flying propellors that are activated by rubbing your hands together in a quick motion. The propellor then rises up in the air like magic and looks like a flying fairy. He also gave us some bubble makers – small bottles of soapy liquid with some straws to make big bubbles. I thought to myself why did he choose us to give us those gifts? Was he somehow able to see how much we love toys?…..
After all, just the other day as we walked by a children’s park, we both stopped to ride the bunny and before that I rode a Panda…..
At the entrance to the temple there was a small shrine for children in which people deposited children’s toys, and lit candles and wooden sticks with written blessings on them. They do this either to commemorate a lost child or to pray for the health and well being of a child. We climbed the stone stairs with some old guys, some of them with oxygen tanks on their backs. People come to this temple to seek healing. When we reached the middle of the stairs, I saw a tall waterfall to the left. Under the waterfall stood the man who had given me the children’s toys. He had changed his clothes to all white clothing, and he was holding a Buddhist rosary in his hands and was chanting and praying under the waterfall. He was also shivering from the cold water, but his resolve and constitution were so strong, that he did not move. I was in awe of his inner powers. Later, after he had changed his wet white clothes to track pants and a t-shirt, he told us that he had been meditating for 25 years and that he had run up and down the very long stone staircase of the temple, 1700 times. His eyes glowed like a master who does not draw his wisdom from the world, nor does henseek for others approval, but from a fountain of inner light. He told us that while praying under the waterfall and chanting, he saw a green light in his inner eye. I thought that was very interesting, since this temple is called the green dragon temple. He was not a young man, yet he moved like a muscular tiger. He told us that he practices Karate. Before he left, I gave him an Osettai of the $10 that the old lady on the bus had given me the day before. He refused at first, but I was very insistent. After all, a master who has meditated for 25 years and climbed the temple stairs 1700 times, did not have lots of time to make money in the world, and I was sure it would help a little. Jules adds: “Meeting this master was truly an honor for me. I wish that my Japanese fluency was greater, so that I could have had a longer conversation with him. The other pilgrims that we saw in this temple were mostly seeking healing. Some of them walked with walkers or were in wheel chairs. But they were very vibrant and happy to meet us. When we were walking towards the temple, we saw a resort up on top of the nearby hill that looked like a fortress, perched high above the forest and the sea. It turned out to be our hotel for the night. The road that twisted up to the hotel, was over four kilometers long, but there was a very steep forest path to take us straight from the temple to the hotel. Jules joked that we could cancel and keep on walking, to cut down on the distance of tomorrow’s long walk. Tomorrow we have two options of routes to walk, both of them long. One road is the more common road that everyone takes, but it requires that we walk back to the bridge that we have already crossed, about five kilometers ago, and start going west. This road has plenty of vending machines to buy water and snacks. We decided to go on a twisting, winding road that resembles the Green Dragon’s Spine. Our room has some breathtaking views of the ocean, and it faced east, so the sunrise would be easily enjoyed, if we managed to wake up at about 5am.. In the distance I could see a helicopter pad that could evacuate people from this remote island effortlessly. “It is not an airport for my hotel.” Said the friendly hotel owner to us when we told him that we saw the Heli Pad. “It is mostly used for emergency services or to get sick people to a nearby hospital.” He added. I was the only one soaking in the women’s Ofuro bath. We had arrived early, and I soaked overlooking the green mountains. On the slopes, I saw a wooden hut that had two giant hogs sleeping in the shade. I felt happiness flood my heart. I felt so grateful to be alive and to be here….. I felt so strong and beautiful, that waves of pleasures went through me….. Everything felt so perfect and I was so happy to be here now…. We were served a lovely and fresh dinner at the dining hall among other diners. Some had booked rooms that included a feast for dinner, and they had large communal plates full of fresh seafood placed at the center of the table. All we had eaten for lunch was a bag of peanuts which we shared with some stray cats in a rest area by the beach, and our eyes envied their large plates of seafood, after we had finished the tiny bento boxes of our dinner. We thought about ordering and buying more food, but we chose against it. We are still in the asceticism part of our journey towards enlightenment, and somehow it did not feel right to go to bed with a stomach full of sea creatures. We sat in the lobby where the Internet was fast. The hotel’s owner told us that he was a fan of the Denver Broncos. I asked him why he had chosen the Denver Broncos from all the football teams in the USA, and he said that he is a fan of their quarterback, who comes from a big football family. Later he asked us where we plan to stay for the next few days, and helped me choose our walking route, told me about a road closure and made some phone calls to book accommodation for us. He even negotiated a better rate for us in a very nice Onsen hotel, telling them that we were walking pilgrims and that they should not charge us so much. He also plopped into my lap his beloved pet ferret, who was so excited to be out of its cage that it acted like a mischievous puppy. We set up our own futon beds, clean sheets, and gravel pillows on the tatami floor in our room, and slipped easily into the dream world. Tomorrow we walk the long route on the dragon’s spine!